During the first week in August 2016 I received reports of a "white" House Martin. One report was from Knockenkelly, another from Auchencairn and a third from Kingscross. It would have been the same bird. It was with normal coloured House Martins. Valiant efforts were made to try to photograph the bird. The one above is the best image to date. 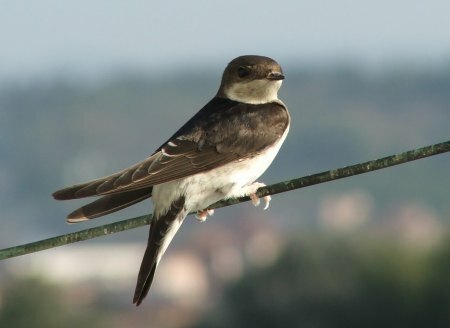 Below is a House Martin in its more normal colours. The bird is leucistic. The plumage lacks melanin pigment due to the cells responsible for melanin production being absent. This results in white feathers, unless the normal plumage colour also comprises carotenoids (e.g. yellows), which remain unaffected by the condition. The reduction of pigment in leucistic birds causes feathers to weaken and be more prone to wear. In some situations this can hinder flight, which, in addition to leucistic birds usually being more conspicuous, can heighten risk of predation. Albinism also results in white feathers but true albinos are thought to be rare in the wild. Albinism is caused a genetic mutation. An albino individual is unable to produce melanin pigments. This leads to a good diagnostic feature with which to distinguish leucistic and albino individuals – the colour of the eye. Albinos have pink eyes while the iris pigmentation of leucistic birds remains dark. The link also includes a simple on line survey that you should complete if you have seen a bird with this type of unusual plumage.